This was a New event for 2012, 5 miles seems to be a rare distance these days so we thought we would give runners the opportunity to try out this once popular test. Runners must be 15 years or older on the day to run. 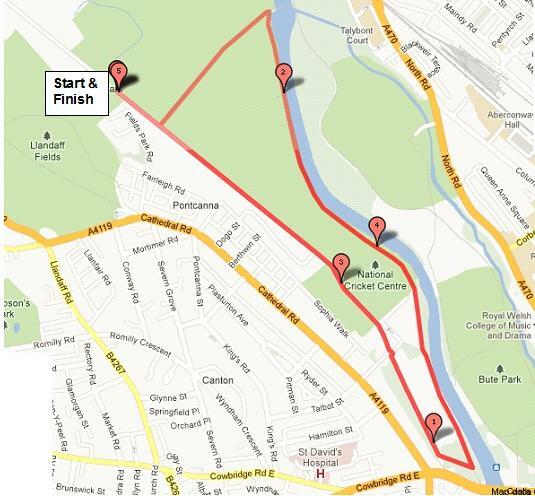 The course is accurately measured and is the same as the one used for the Old Father Time 5 mile, which starts and finishes on the Spine Road that runs through Pontcanna Fields. To get to the course from Llandaff Rugby Club, cross the footbridge and head along Western Ave towards the River Taff, turn into Pontcanna Fields along the Spine Road.